WHEY 100! _CFM 90 = ULTRA PURE ISOLATE !! Beyond any doubt, protein is the most important nutrient for muscle maintenance and growth. Each protein source has different biological value (BV) and, therefore, the benefits to the body and the muscles differ. Whey protein has the highest biological value compared to any other form of protein, which is very important since the body can fully utilize it by retaining the highest percentage of valuable nitrogen. WHEY 100! 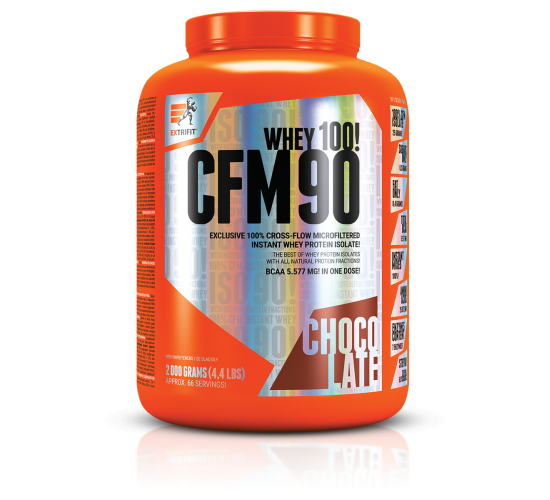 _CFM 90 contains superior quality, micro-filtered whey with 90% content in whey isolate!! It promptly feeds the muscles with 26.4 grams of pure protein per dose (1 scoop) while containing vital immunoglobulins that contribute to the proper functioning of the immune system and promote muscle recovery and restoration. Valuable whey protein is isolated by using the latest micro-filtration technology and the highest levels of L-glutamine and BCAA per dose are achieved. In particular, WHEY 100! _CFM 90 contains 4782 mg of l-glutamine and 6050 mg of BCAAs per scoop!! -High absorption and immediate conversion to amino acids by the body. -Special absorption mechanism with 7 digestive enzymes. -Promotes rapid muscle recovery after any physical activity. -Supports increased lean muscle mass and normal metabolic function. WHEY 100! _CFM 90 can be used by athletes, trainees and active people who want a high-protein and of high biological value protein shake in their daily diet. -Contains only 0.1 grams of fat and 1.1 grams of carbohydrates per dose. -Contains the natural sweetener Stevia. -It’s available in delicious flavors!! -The product is immediately soluble!! because of minimal content of carbohydrates and fat it is excellent protein source for individuals trying to reduce body fat.